Doug's Auto Tune & Repair has been providing honest, reliable automobile service on the Eastside since 1981. Unsatisfied with their existing web presence and wanting to revitalize their identity, Doug's approached Reveal for a complete brand update. After meeting with the company owners to determine their objectives, we began by giving the Doug's Auto Tune logo and store signage a clean, new look. 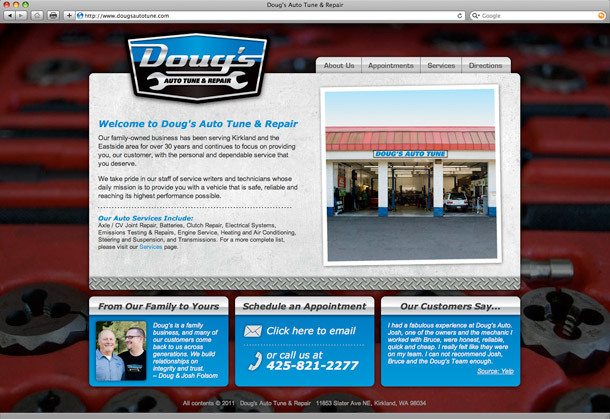 Moving to the website, our research showed that Doug's had a very strong online presence with consumer review sites. We took advantage of this asset by rotating actual customer reviews on each page of the new site, with source links to provide authenticity. Overall, the new branding and website reinforce the quality of service and trust that Doug's has been providing customers for over 30 years. Mammography Reporting System, (MRS) is the most widely used tracking & reporting software in the world for all breast-related procedures. 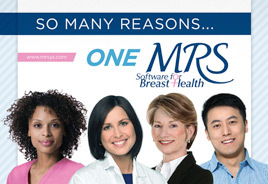 From Radiologists to Administrators, Technologists and IT, the entire clinic saves time and works more efficiently with MRS. Intended as a conversation starter, the new campaign hints at both the broad spectrum of users and the multitude of features that MRS provides. The campaign has been implemented on exhibit displays and marketing brochures, and will soon introduce the corporate website through an interactive banner. GDW/a provides internationally recognized architectural, interior and planning services to residential and commercial clients. GDW/a contacted Reveal to revitalize the design of their website, which serves as a marketing tool as well as a resource for clients. 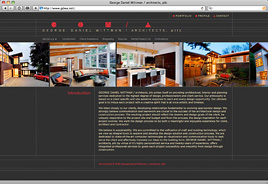 The finished website showcases over 50 projects, and reflects the beauty and modernism of the work GDW/a provides. Kirkland, WA – Reveal Creative has been announced as a top-ten finalist in the second annual Graphic Design USA Magazine Digital Print Cover Contest sponsored by Kodak. Based upon an illustration by Creative Director Jason Howard, the design observes the arrival of fall in the Pacific Northwest. Winners were chosen based on overall visual appearance, effective use and integration of Kodak NexPress Fifth Imaging Unit Solutions. The top ten winning entries will be published in the September issue of GDUSA Magazine and featured on the Kodak website. Home Benefit Network (HBN) is a companion to traditional employee assistance programs, providing access to local experts, valuable discounts and resources to help make everyday life easier. Working closely with HBN leadership, we determined that two categories of marketing materials were needed. One to encourage companies to incorporate HBN services into their employee benefits program, and another to introduce employees to their new benefits. We designed layouts that could be repurposed for both categories, using distinct photography to differentiate the two targets. 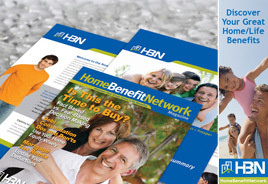 The resulting collateral makes it easy for HBN employees to distinguish the programs, and provides a seamless transition between corporate and employee marketing. Dedicated to unparalleled craftsmanship and service, Peak Builders has been providing Mercer Island residents with the finest in home renovations since 2001. Recently, Reveal Creative was approached to design a their company website. Strengthen their online presence while demonstrating their work and experience and reinforcing their core business principles. The contemporary design and color palette mirror the modern design sensibility that Peak Builders bring to their projects. 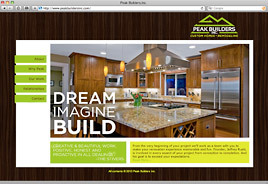 Logical page and navigation structures are central to the layout, allowing users to quickly find important information and view the impressive portfolio of work Peak Builders has delivered to their clients. 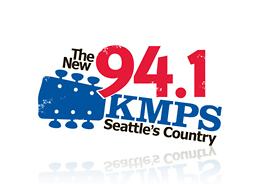 The New 94.1 KMPS is Seattle's premier country radio station, and was honored in 2010 by the Academy of Country Music as the best major market station in the nation. After more than twenty years using their familiar bandana-style logo, it was time for a completely fresh approach to their visual identity. Reveal Creative worked closely with key management in redefining the station's brand presence to its urban audience. We began by studying the storied history of KMPS in Seattle, evaluating its regional and national competition, and the variety of promotional usage applications required by the station. The logo was then expanded across a new corporate identity system, print materials and their online presence, all coordinated to provide the company with a solid new brand platform. 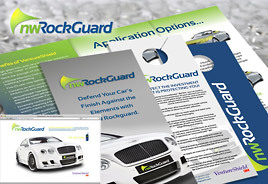 NW RockGuard is dedicated to providing an exceptional resource for premier automotive dealers in the Pacific Northwest. As a recognized leader in the installation of VentureShield protective film, their mission is to exceed the expectations of their dealer clients and end-customers alike. Recently, Reveal Creative was approached to refresh their brand identity from the ground up. We began by creating a logo that reflects the strength and purpose of their product, and serves as a cornerstone for the new brand. The logo was then expanded across a corporate identity system, sales and POP materials and a new website, all coordinated to provide the company with a solid marketing platform. Microsoft Services is the consulting and enterprise support division of Microsoft. With a global team of nearly 10,000 professionals in 88 countries, they help customers worldwide achieve their business objectives each year. This means not only helping with deploying and optimizing IT, but also assisting businesses in moving forward with IT initiatives that deliver the most business value. Reveal Creative was approached to produce an integrated package of collateral materials for promoting their customer Premier Renewal program to a global audience. 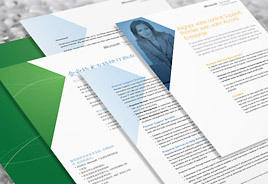 Providing detailed project management and coordinating with multiple content owners, we delivered more than 100-pages of program information for localized global distribution. The language-specific marketing kit components included introductory letters, 8- to 12-page renewal guides, a custom.aspL email template, and more. The Lester R. Sauvage Healing Heart Guild was formed by two sisters whose lives were deeply touched by their brother's battle with heart disease. With the purpose of supporting the vision and programs of The Hope Heart Institute in Bellevue, the Guild holds an auction each February as their primary fundraising event. Reveal Creative is pleased to have been an In-Kind Sponsor by providing branding design and support services for their 2010 marketing efforts. 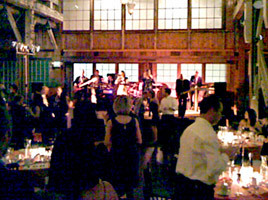 This year's event was held at Sodo Park by Herban Feast in Seattle which blends rustic charm with understated elegance into a truly unique venue. Through the hard work and dedication of the Guild and its supporters, donations significantly exceeded last year while providing those in attendance with an evening of celebration and inspiration. 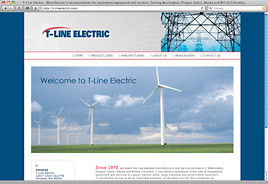 T-Line Electric specializes in the sale of engineered equipment and services to support electric utility, large industrial and government customers. Their mission: to be an important sales extension for the companies they represent while serving as a valuable resource to their customers. Reveal Creative successfully achieved their goal of creating an upscale, professional website which conveys their position in the regional marketplace. Kirkland, WA - Reveal Creative has just been honored as a winner in the 2009 American Graphic Design Awards for the Donate Life Today's 2009 Giving Luncheon invitations. During a year-long marketing campaign, Reveal developed the concept and design theme, created a dedicated event website, and delivered more than twenty web and print collateral pieces in all. Through the hard work of the Donate Life Today staff and a cohesive branding and marketing effort, this year's Luncheon was a resounding success. 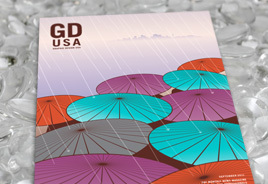 For more than four decades, Graphic Design USA has sponsored national design competitions that spotlight areas of excellence and opportunity for creative professionals. The American Graphic Design Awards is the biggest of these, and honors work of all kinds and across all media. Winners are chosen from more than 10,000 entries. The Washington Red Raspberry Commission (WRRC) was formed in 1976 to support and promote the state's raspberry industry. Having already designed their brand identity and informational website, we were approached in June to create a dynamic trade show exhibit for use during the many events that they attend each year. To communicate their core message through an inviting visual design that would encourage attendees to learn more about the WRRC. Combining striking imagery and elegant typography, our design emphasizes the product and conveys the healthful benefits of raspberry consumption. The appearance is bold and approachable, solving the challenge while helping the WRRC stand out among other exhibitors. Since 1980, the Law Offices of Simon Forgette have successfully represented victims of brain injury, spinal cord injury, and other severe injuries. As a former board member of several industry associations, as well as previous chairman of the board of the National Head Injury Foundation, Mr. Forgette is a recipient of numerous awards for his dedication to the rights of brain injury survivors and their families. Reveal Creative was approached to develop the firm's online presence and refine their branding standards. Launched in February 2009, the website is designed to immediately convey integrity and professionalism to the viewer while prominently featuring the high-profile cases that they have successfully litigated. Parker Training is dedicated to teaching rotational hitting mechanics to players and coaches regionally and all along the west coast. With more than 23 years of experience, owner and founder Sparky Parker shares everything he knows when it comes to teaching rotational hitting mechanics. In January, Reveal Creative completed and launched their brand new website (www.rotationalhitter.com) which gives amateur athletes of all ages access to the tools they need to develop and grow their skills.